My first reef tank started out as a disaster and turned in to a balanced, thriving system. This progress was part luck, part research, and part learning things the hard way. Originally it was a 29 gallon tank with no sump or skimmer. I can’t remember for sure what the first light was, but I’m sure it wasn’t good. At one point it wasn’t much more than a hair algae farm. I was using tap water which greatly encouraged the hair algae. I even remember telling someone at the LFS how great it was that my tap was so good. Now I laugh out how foolish I was for trying to cut corners so much. At one point in the 29 the heater failed on (like the usually do). This killed the big bubble tip anemone that was in there, most of the corals and inverts, and I believe some of the fish. I now use heaters that are barely strong enough to keep the tank warm or cut that power in half and use two heaters. I moved the tank and in the process upgraded from the 29 to a 45 (36x12x24). The downside to this tank was it was so narrow. It was hard to get the rock arranged in a way that didn’t have it leaning against the front or sides, looked good, and provided good places for corals. Shortly after the upgrade I added a sump and HOB overflow box. I made the sump myself out of a 10 gallon. I used clear glass baffles, but I should have used smoked glass because they would have prevented algae from growing outside the refugium. The sump had a small section for the water to come in, two baffles, the refugium, a baffle with mesh wall, and finally the pump section. The mesh wall was actually one of the best things I came up with for this system. I siliconed in a 6″ tall baffle like usual, but attached to it on both sides I siliconed eggcrate (hard plastic grid). Between the eggcrate I was able to slip in a piece of needlepoint canvas (plastic mesh). This meant that the mesh could come out easily to be cleaned, was firmly in place, and the perfect size to keep everything out of the pump section (macroalgae, fish, inverts, etc.). I have since made this a standard feature on all my sumps. This feature has saved tons of fish and drastically cuts down on maintenance (you effectively never have to go in and clean macroalgae out of the pump intakes). One person emailed me saying it was ‘genius’ and how it saved his pipefish that kept going down the overflow and making their way to the refugium. I used an Eshopps overflow box, but made a few changes. I did not use their flexible tubing, I hard plumbed it with PVC pipes. This guaranteed it was firmly held open with no extra length, no dips or low spots, etc. It also let me change the length of the last piece of PVC going down in to the sump. Since it is okay if water leaks a little around the top of this piece since it would just drip in to the sump, I didn’t glue the last piece on. This allowed me to remove it to get the sump or overflow on more easily. It also let me replace it with pieces of different lengths so I could minimize noise. I removed the pre-filter foam, I didn’t want anything to need extra maintenance or possibly clog. I added some PVC to the inside to help silence it. I put a tee on sideways, cut off the part that stuck out the side, and added a cap to the top with a hole drilled in it. This made it almost silent. I painted the u-tube black so that algae wouldn’t grow inside it. I actually had to replace the original u-tube that came with it because it was slightly too short and lost siphon every time the pump was off. Oddly Eshopps’ replacement u-tube at the time was slightly longer than the ones that came with the overflow box, so that was all the fix I needed. 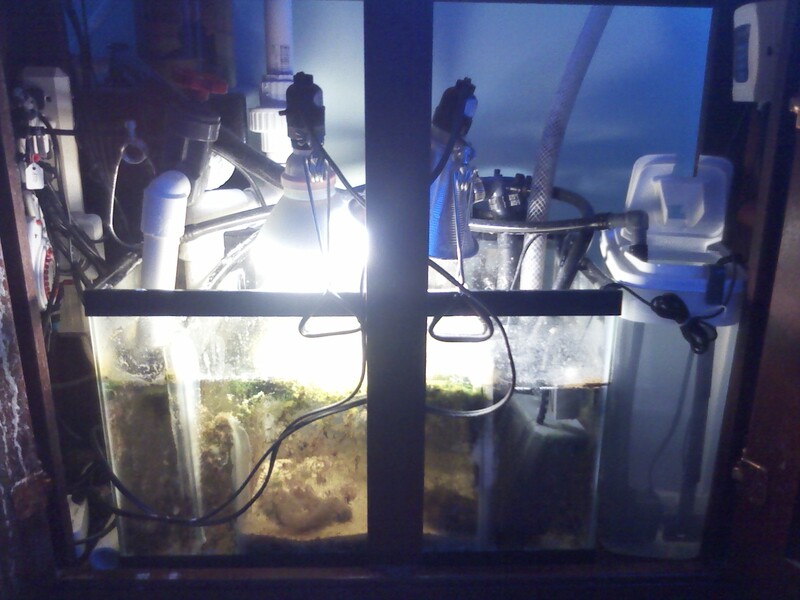 In addition to the sump I added a better light. At first I used a Coralife 2x 96 watt compact fluorescent fixture. Later I upgraded to a Current 4x 96 watt compact fluorescent. At the time compact fluorescents were going out of style (they were pretty much already out the door) and I used them because I got a great deal on them from where I was working. One thing I learned from all this was that you don’t need certain lights, you just need a lot of light. You need a lot of good light. Compact fluorescents, like HOT5s, gave you the option to pick the exact color combination you want. I had two 10,000K bulbs and 2 actinic bulbs. 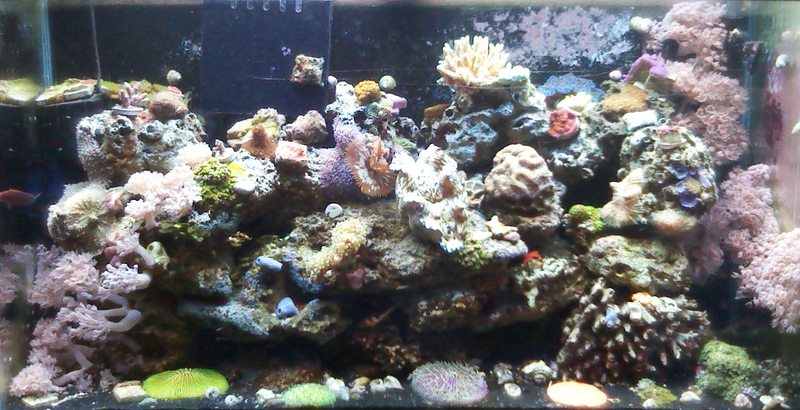 This was a lot of light in the right color mix so that corals grew well and were bright. The larger fixture was actually the same size as the footprint of the tank, so the tank basically had a full, even wall of light coming down over the entire tank. When I moved the tank I added a SeaClone protein skimmer. At first any skimmer was better than no skimmer, but even this was a bit of a stretch. Eventually it leaked (like so many SeaClones do) and that prompted me to upgrade. I didn’t have room in the sump so the only options were another HOB skimmer or an external skimmer. I opted for the second option. I got an AquaC EV-180. These can sit outside of the sump and instead of being a venturi air intake they are spray injection. That means the pump has nothing to do with the air, instead the water passes through a chamber of air right before it enters the main reaction chamber of the skimmer. So the skimmer doesn’t have to be right next to the pump. These skimmers are very adjustable. You can control the water going in, the air going in, and the water going out. So although this may mean more tweaking, once they are tuned in they are more precisely controlled and can be very productive. In the end I had about 120 pounds of live rock, roughly three pounds per gallon. I think this had a big impact on how well the system ran and why there was no detectable nitrate. It didn’t all start out as live rock. Roughly 2/3 of it started as dry base rock, or old live rock that was dead by the time I got it. So I saved a lot of money by not buying all live rock, which allowed me to buy really good live rock. Buying that really good rock brought in all the good stuff that was then able to spread over the whole system. If I had bought all live rock I would have only been able to afford very basic, low-grade live rock, like base rock. Over time I also added a couple really nice pieces I came across here and there. One was probably a quarter pound, but had 5 different colored sponges on it: pink, black, yellow, purple, and orange. As long as the rock is cured and you transport it completely submerged it should stay completely cured and you will be able to add it directly to an established tank. The lighting was enough for any coral I wanted. I had Fungia spp. plate corals at the bottom of the tank, lots of LPS, SPS, and even clams. And the clams were very happy, looked great, and were growing. 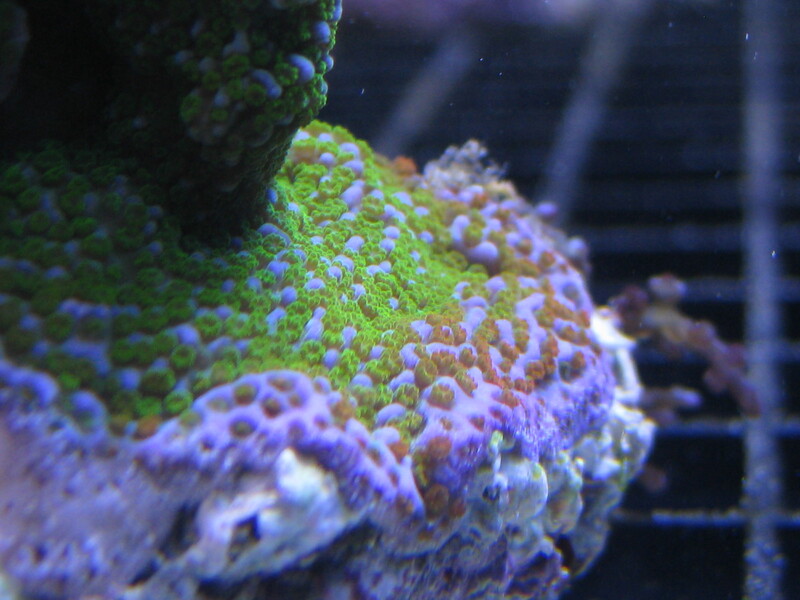 Don’t let people convince you that you have to have certain light for certain corals. You need good light, and a lot of it, but it doesn’t have to be LED, halide, etc. I had: Xenia, Zoanthids, mushrooms (Rhodactis and Discosoma), Symphyllia, frogspawn Euphyllia, green birdsnest, blue star polyps, Montipora (including some growing on the glass), and some sort of blue Acropora. 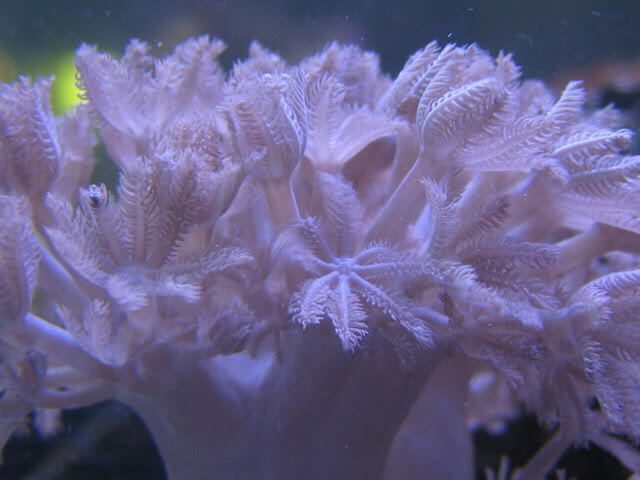 I know some people don’t like Xenia, but the pulsing/white/pink pom pom Xenia I had was one of my favorite corals. 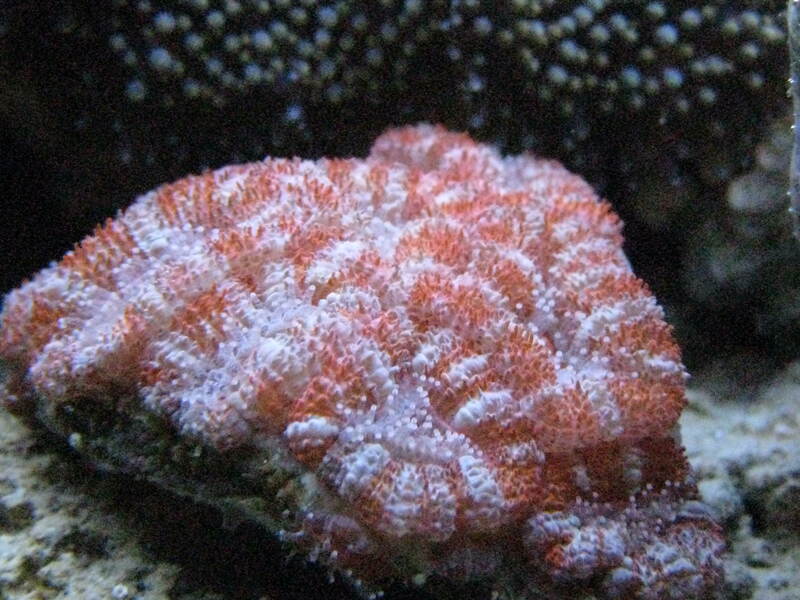 People love corals that move, and one that moves on its own is even better in my opinion. The gentle, mesmerizing pulses are almost hypnotic. Yes, they can get out of control, but you can always remove them and sell them if you want to. They can even be used in a refugium since they can grow so well they can be used for nutrient export. This is another important thing I learned with this tank: keep what YOU like in it. This is no one’s tank but yours. You may be able to keep SPS, but if what you love most are Xenia and mushrooms, keep those. Keep the things in the tank you enjoy most, no matter what other people say. At one point I thought there was something wrong with my refugium. The chaeto wasn’t growing so I thought the bulbs weren’t strong enough or were the wrong color. I tested the nitrate and phosphate and it turns out both were undetectable. So the reason the chaeto wasn’t growing was because there simply weren’t any nutrients in the water for it to extract. This is a very good sign that a system is very well balanced. I had no mechanical media in the entire system. I didn’t want pads on powerheads or in the overflow just so they could get clogged, need maintenance, cause a flood, etc. And I didn’t want to have to deal with extra maintenance in the sump either (especially not filter socks). So instead I simply let everything keep moving until a natural filter feeder ate it. I had sponges, tubeworms, Gorgonian, etc. All of them are maintenance free, natural options that are more reliable and no work. Right: These are some of the pineapple sponges that came in on the live rock and then spread to other parts of the system. I also added media reactors. I had three TLF Phosban Reactors daisy chained together. The water went from less specific to more specific media: Seachem Matrix Carbon, Pura PhosLock GFO, and finally Seachem Purigen. These hung off the back of the sump. The pump was in the pump section and the drain emptied in to the first section of the sump. I probably wouldn’t worry about the carbon if I did it again, but the GFO and Purigen are worth doing once the tank is in good enough condition. One note here: all the tubing in the sump was black so that the lights on the refugium wouldn’t cause algae to grow inside them. 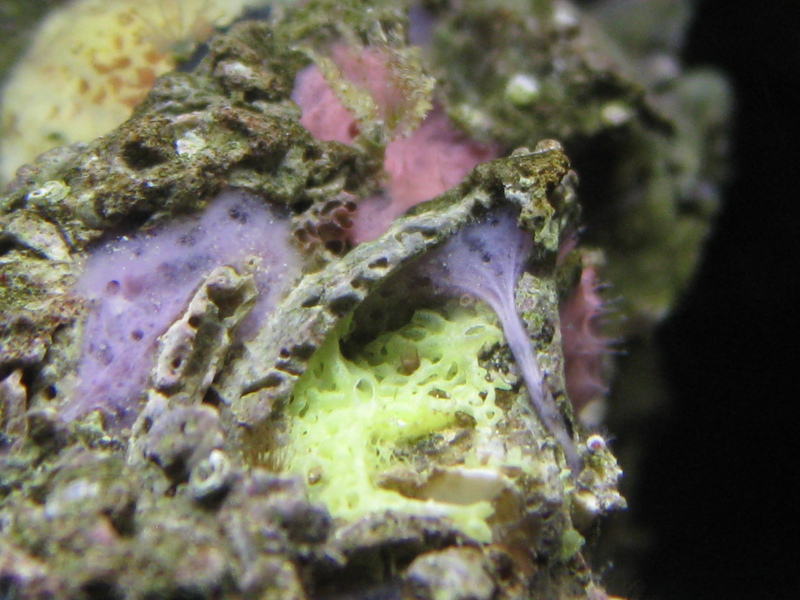 I have seen sumps with coralline algae growing inside the tubes because there is so much light on them from the refugium. I added an automatic top off (ATO). I used the JBJ ATO. It has a float sensor for the reservoir, a float sensor for the tank (in the sump if you have one), and an outlet to plug in a pump in the reservoir. When enough water evaporates from the system the float sensor triggers the pump to run. If there is no water in the reservoir the float sensor in there lets the controller know not to try to run the pump dry. In my setup the reservoir was a little 3 gallon cereal container that happened to fit perfectly just to the right of the sump. In general my water changes were roughly 10% per week. I rarely did more than this. The one exception I can remember was when I was gone for a week and the tank was overfed in that time. I came back to an algae farm. I did 10% water changes every day for a week and got the tank right back to where it was before I left. This cemented my current belief that water changes are usually the main fix needed for almost all problems. For the most part I fed New Life Spectrum pellets. 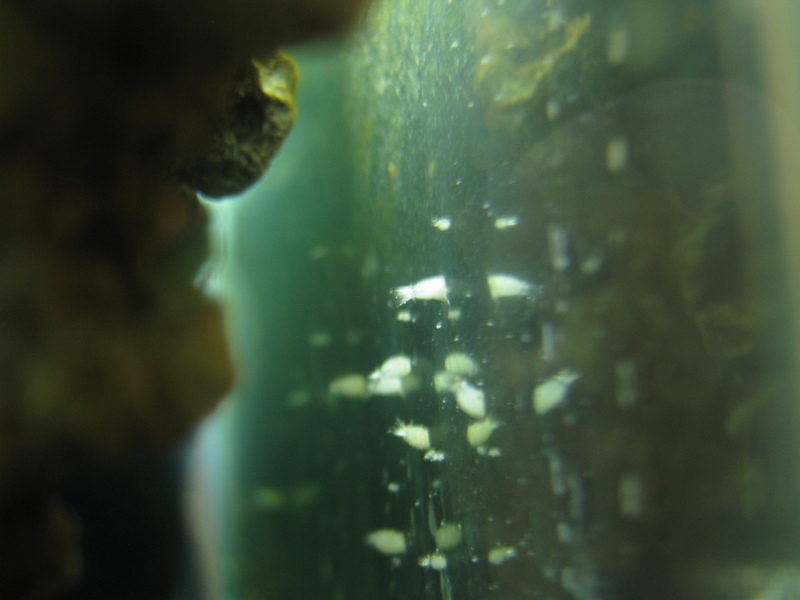 Even many of the LPS corals would happily grab and eat the 3mm pellets. Once a week I would go in with a small handful and give one pellet to each acan head, frogspawn head, etc. I also fed things like Cyclopeeze, oyster eggs, etc. 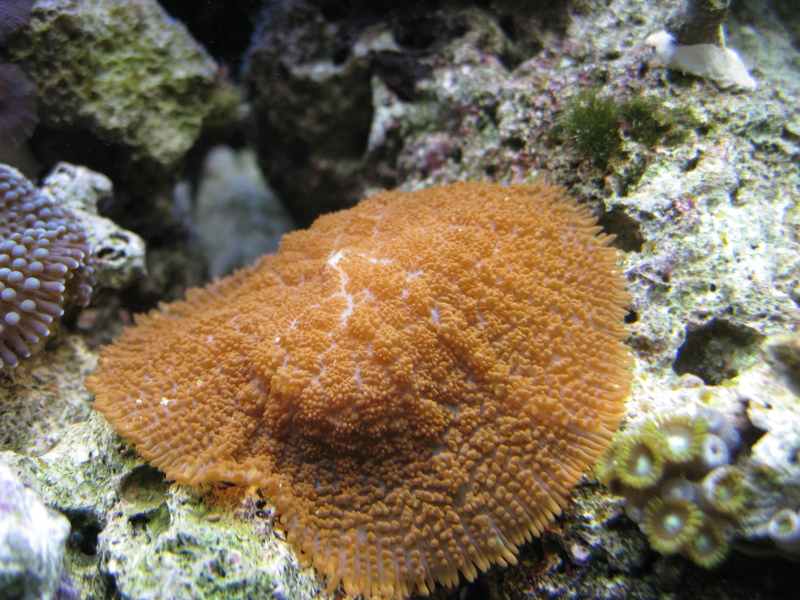 Since I had so many different corals and so many thriving filter feeders, as well as a variety of fish, all foods were eaten well with effectively no waste left to rot in the system. The sump housed a green mantis shrimp that I pulled out of a piece of live rock. A refugium is a great place to keep something like this, something interesting that would just be too destructive in the display (or disappear never to be seen again, even if it is alive. I have seen people keep anything from mantis shrimp and reef lobsters, to giant hermit crabs and non-reef fish like puffers or damsels in refugiums. It just adds yet another enjoyable option to the system. This is the part I hate to talk about because what destroyed my system was a very basic, stupid mistake. I had the ATO running and knew how long it took to go through its three gallons. I was dosing baking soda daily so I knew how much I needed per day. Kalkwasser would have been better, but still would have produced the same problem. I added the baking soda to the ATO thinking it would dissolve, dilute evenly throughout the reservoir, and be added appropriately across the right number of days as the tank was topped off. I didn’t realize it would just create a heavy, concentrated layer at the bottom of the ATO reservoir, where the pump was going to pull. The next day I looked at the tank and everything was dying. 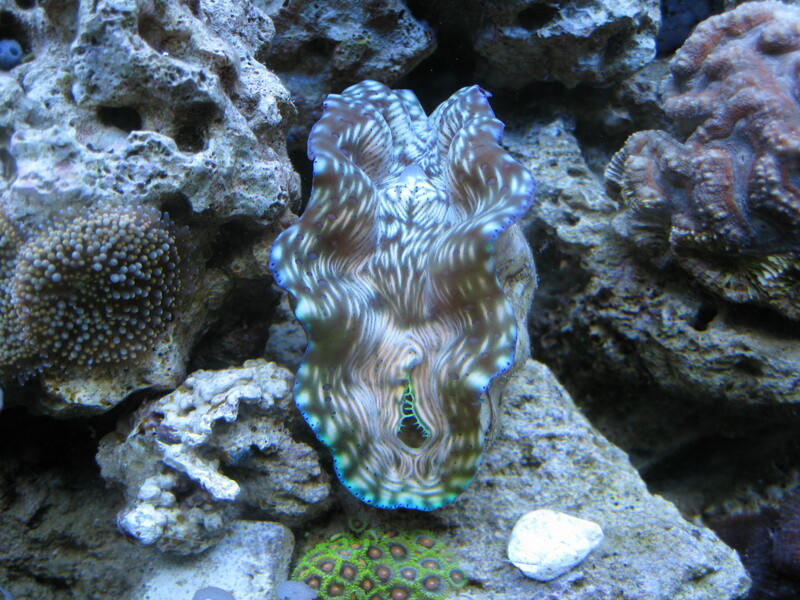 All the corals were limp, the clams were gaping open, the Xenia wasn’t pulsing, everything was wrong. I quickly figured out my mistake. I tested the pH and it was 8.6. The tank had received three days worth of baking soda in one dose. I don’t know how high it actually got, but that’s what the pH tested at that time. Online I got support and they said as long as it isn’t over 8.6 don’t go crazy and start doing big water changes, so I didn’t. But the damage was done. If I had either a small pump or even a small air stone circulating the ATO reservoir (equivalent of a kalk stirrer) it would have kept the baking soda stirred up and prevented the crash completely. I hope this helps someone prevent a similar stupid mistake from destroying their whole system. I do think this tank is a great example of how well a tank can go when you keep it smaller. You can afford enough rock, a skimmer that’s actually good enough, and enough light. If I had tried to do this in something like a 125 I probably would have never got it running so well. I learned a lot through the process of my first reef tank. You don’t have to have the best of the best or go high tech to have success, even with stuff like SPS and clams. I plan on setting up another tank in the very near future, somewhere between a 40breeder and a 75. I have two 75s, otherwise it would probably be a three foot long 65. There are a few changes I will make, but overall I just miss this tank. Going reef can be overwhelming at first, but with the right research, taking your time, not cutting corners, and just enjoying it most people can have a thriving and very enjoyable reef tank. They aren’t as bad as most people make them out to be. 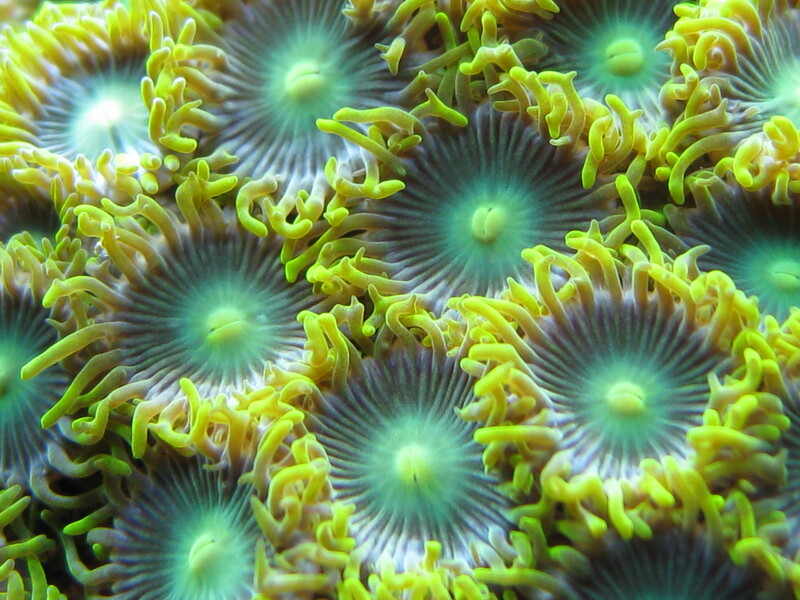 Many corals are very hardy and forgiving. I would argue that corals are easier than saltwater fish. 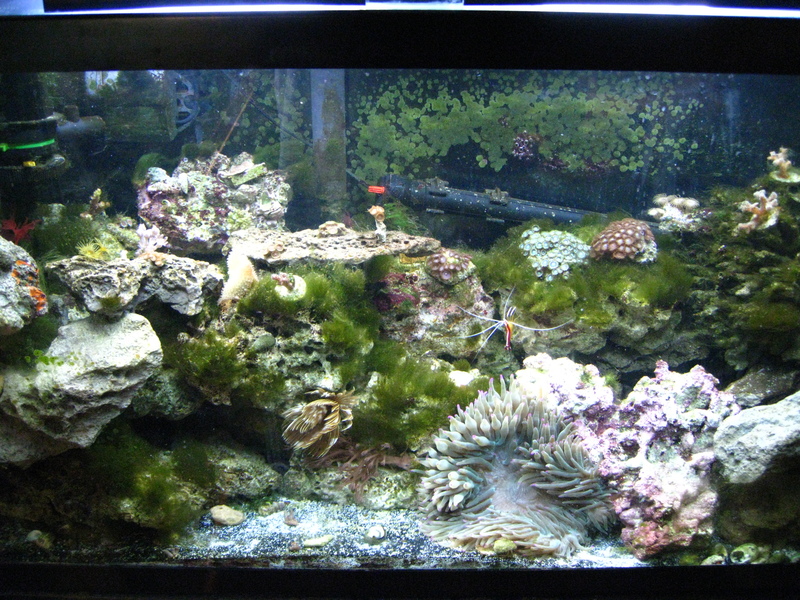 If you can keep any saltwater fish, you are almost certainly capable of keeping a reef tank.